Automatic employee time and productivity tracking! Yaware helps track all your activities automatically without the need to start and stop a timer. From time spend on projects, to websites, software, email, phone calls and much more. Measure and boost your teams productivity by up to 400%! Is your team overloaded? Do they spend too much time on meetings and support? Which projects are taking longer than planned and why? Find out with the help of Yaware time tracking. Yaware time tracking works on any computer, tablet or mobile phone. Stay efficient and productive wherever you are. Measure everything, anytime, anywhere. Where does your time go? Is it productive? Do you feel you lack that one day to get everything done on time? 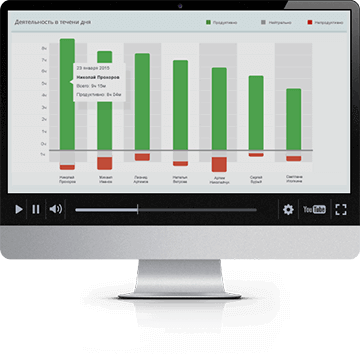 Assess the quality and speed of your work, analyze productivity patterns and factors, eliminate time wasters to quickly boost productivity on a personal level. Prevent burnouts and overloads and give your team advice on organizing their day evenly so they can stay productive and accomplish everything on time. Help employees with flexible schedules define their core working hours and manage any overtime and flexitime. Define which software and websites you need to perform tasks and for how long. Can you speed up performance and make things easier or is there anything distracting which you could avoid? Find out exactly how much time you spend on each application, automatically. Assess team collaboration and interactions among employees, create a comfortable working environment, take a look at how the work on each project is progressing at any moment of the day – all of this with live visuals and reports from Yaware.TimeTracker. Improve your benefit system to fairly reward and motivate your team, develop new talent management programs based on real achievements – with precise numbers on everyone’s performance new milestones can be reached faster. Stay connected with your team wherever you are. Yaware.TimeTracker delivers daily/weekly/monthly notifications to keep you updated on the most relevant and valuable data on productivity and performance. 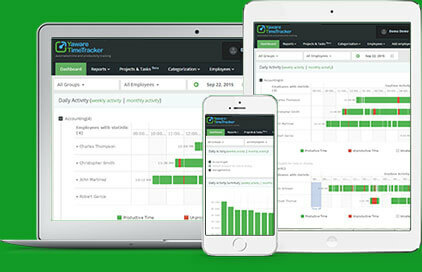 Groupon uses Yaware.TimeTracker as one of the main tools in assessing the quality of work. The features fully meet our needs and allows us to manage the process remotely. Yaware.TimeTracker provides me with objective measures that I can use to monitor productivity and guide my developers to improve their performance. Great service and easy to use. As a designer, Yaware.TimeTracker has really helped me personally become more productive. I know exactly where my time goes and how I can improve my day to day. Thoroughly recommended.